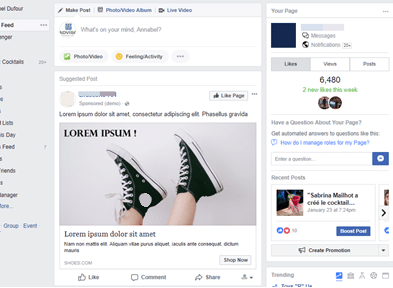 This article will guide you in the creation of your ads, and will help you optimize the quality of your visuals, and the relevance and coherence of your messages. You will find practical tips on creating simple, effective and powerful ads. 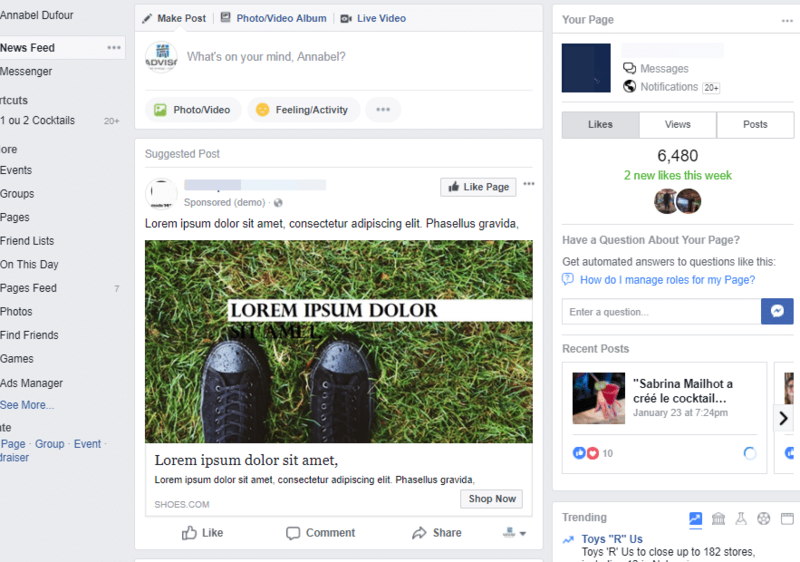 Facebook is known for being a platform that brings together a massive pool of users, reaches highly qualified audiences and is relatively easy to use. For advertisers, the advertising and strategic potential of having that many users gathered in once place is enormous. However, Facebook is now so saturated with businesses that it’s getting hard to stand out: in 2017, the platform boasted more than 5 million active advertisers. The key to ensuring that users don’t feel like they’re drowning in this sea of ads? Adapt each of your ads to capture the user’s attention as quickly as possible. Frequent Facebook users visit the platform first and foremost to get fun, useful content. There’s no reason for your ads to go unseen. First of all, it’s important to define the goal of your ad. This step will follow you throughout the creative process, and you’ll be able to reference it when you’re choosing copy and visuals. There are several angles you can explore: presenting promotions, sharing information, presenting products or services, sales, etc. Your ads should always reflect the goal you set at the outset, to ensure they’re as relevant and consistent as possible, and able to achieve the highest results. The image is without a doubt the most important element of your ad. It’s the first thing users see, so it has a major impact on the ad’s success. Of the thousands of images that appear in a user’s news feed, only the most original successfully attract their attention. What do those have in common? They are extremely high quality, visually attractive and intrinsically shareable. What makes an image visually appealing? Every image you use in your organization’s communications contributes to the perception users have of your brand and your products, both positive and negative, on your social channels as well as in your traditional campaigns. 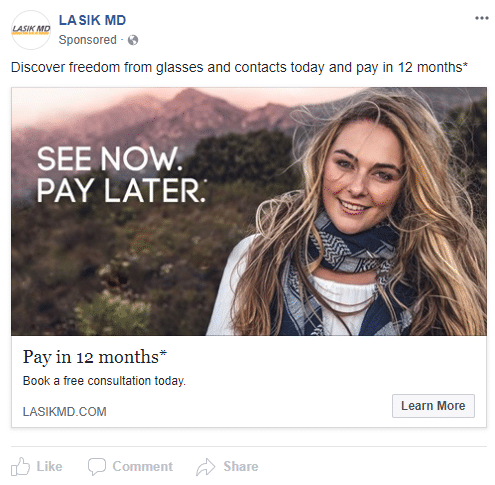 It goes without saying that the quality of the images you choose will have a significant impact on how people engage with your ad: the higher the image quality, the greater the chances that the ad will be shared and commented on. Conversely, even an excellent product is likely to be ignored if it’s presented in a disadvantageous light. Not sure what dimensions your images should be? This infographic should help. After much testing of different creative, we’ve determined that certain colours outperform others. Our advice? Avoid images with white or blue backgrounds; they tend to blend into the platform’s interface and stand out less than images with bright, punchy colours. Here are some examples of ads using bright colours (green) compared to others on a more somber background (grey). Choose a single, catchy sentence, slogan or simply a few words. Image copy should always relate back to your main goal, and be aware that if images have too much text your ad performance could be affected. The Facebook algorithm tends to limit reach when the space occupied by copy surpasses 20%. Here’s a tool to help you respect the ratio. Once again, less is more. Short, catchy descriptive copy that attracts interest by putting the product or service, sales offer, or a fun fact front and centre is enough to make an ad attractive. The heading should immediately convey the nature of the offer and your ad’s call to action to the audience. The headline is the ideal place to insert a promo code, product name or time-bound incentive to create a feeling of urgency. It’s also recommended to use the idea of rarity or a unique selling proposition (USP) to attract even more interest from users. Focus on one message at a time and make sure it aligns with your main goal. * A little tip for brand recognition. Try one of the following in your ad: insert your company logo in an organic way in the image, a slogan, or any other brand visual. An effective ad is very easy to create. You just need to take the time to think about the alignment between the initial goal and the message you’re putting out there. Keep in mind that the image is the most important element of your ad, and investing a bit of time and money could be beneficial. As for the text, the rule “Less is more” applies. Choose differentiating elements and short sentences that pack a punch. And finally, remember that there are no miracle solutions: the key to success is often in the testing and optimization you do every day. Did this article help you? Let us know your comments and suggestions below! With a master from HEC in e-commerce in hand, Annabel leverages the visibility and sales of her clients on the web. Her extensive knowledge of digital media and her experience enable her to offer enlightened strategic support.